I strongly condemn the use of violence in recent days that has caused many deaths both at Trat Province and especially at Rachaprasong today, which is particularly saddening and disturbing since the lives of children were lost. My deepest condolences are for the victims who are injured and to the relatives and friends of those who lost their lives. The violent incidents are terrorist acts for political gains without any regard for human lives. The government will not tolerate terrorism and has ordered a full investigation by authorities to find the culprits and bring them to justice without exception. I would like to ask all sides of the political divide that we may see things differently and there are many ways to express those differences. But the use of violence that lead to deaths are not the civilized way of the living. It is not the way of life of Thais who are naturally considerate and empthatic to fellow citizens, rather than resort to senseless killings. 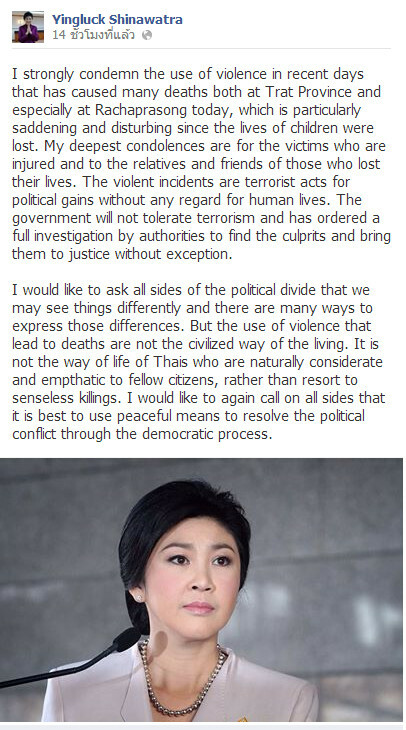 I would like to again call on all sides that it is best to use peaceful means to resolve the political conflict through the democratic process.